Days to Maturity: These guys should fit into almost every garden. Most are in the 50-60 day range, so there shouldn’t be much issue here. Yay! Diseases and Pests: Obviously, Cucumber Mosaic Virus is a big one and you should look for resistant varieties when you can. Other ones that may or may not be a big deal to you are Anthracanose, Downy Mildew, Powdery Mildew, Scab and a whole host of other icky diseases. Just check out your seed catalogs or ask your nursery experts. Use: If you are the kind of amazing gardener who is also a proficient relish, chutney, and pickles- well bully for you! (And may I send you my address to be a taste tester?) You have so many more fun choices! I, on the other hand, look only for great fresh flavor, low seed volume, and longer/skinnier cucumber. Key Words: I find cucumber descriptions to be pretty straightforward. Gherkins are small. If it is great for pickling, it often has “Pickling” in the name. Just look for descriptors that match your needs. My Favorites: These days I’m only growing Tendergreen Burpless and Telegraph Improved as they are large but narrow and have a lower number of seeds. They are never bitter and easy to work with (rarely curvy). They are as tasty small as they are huge, but they don’t seem to get out of control and massive. These two are my favorites and I find them easy to grow from seeds as well. In the past I’ve grown a smaller, round cucumber called Richmond Green Apple which is tasty, but can blow up like a yellow balloon so I’ve stayed away from them in recent years. These guys will certainly punish you if you don’t catch them all under the foliage. I’ve also grown a large pickling type (back when I thought I might be a pickling type), they are nice, but I much prefer the two I listed above. You can see that I’ve not done a whole ton of experimenting with cucumber varieties. I stumbled upon two that I really liked early on and have stuck with them for years. There are a lot of really neat Asian varieties like Suyo Long, Yamato Extra Long, Aonaga Jibai, Gagon, and Natsu Fushinari that I would like to try. These tend to be a bit longer to mature (60-75 days, but even I can grow those in a Zone 4), but rumor has it the flavor is much more interesting than many of the European varieties. Many of these are long and narrow with lower seed volumes, all of which tick my boxes. I’ll let you know which one I decide to try this year! And don’t forget the fun Mexican Sour Gherkin, I’ve seen loads of bloggers growing these. I’ve not yet been tempted, but they take 75 days to mature and are purportedly extremely prolific. With just the two of us to eat them and not preserving them, I’m not sure I want to give them a shot, but they sure are fun! 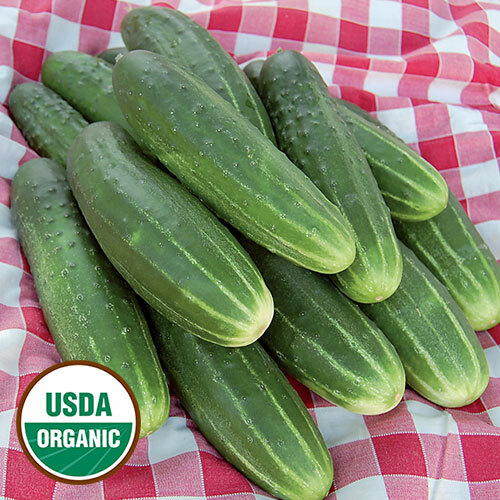 What varieties do you love and what do you do with your cucumbers! I’m hoping some of you will share a recipe or two (hint, hint!). ah yes, the cucumber………you are right, every garden needs them and also every salad. but after that, what do you do with those huge ones?…Have you tried the english variety, long, skinny and fewer seeds. Because I have only a small container garden for veggies, and more shade than I’d like, I’ve had only a few tries at cucumber and had varied success. I tend to go for the smaller ones because they’re quicker to mature. Of course, do I have the seed packet beside me to tell you which ones? No. This year, I picked up some supposed “container” cuke seeds from Renee’s Garden and the vines grew like Jack’s beanstalk! Too much nitrogen, perhaps? Anyway, like you the two of us eat what we grow fresh and love the surprise of finding a new cucumber among the leaves. Often it doesn’t see much more than a knife and a shake of salt before it’s gone. Yes, the old ‘container’ description! I’ve been duped by that one before (peas! )- ha! I’d love to hear what smaller varieties you grow when you find that seed packet! I often wonder if smaller is better, I think I just feel overwhelmed when I get 10 of something small rather than 2 of something large. Weird logic, I know! I do like cukes, both fresh and pickled. We don’t grow any, though, but we like to pick up some nice ones at the farmers’ market. I like the little crunchy kind best, not sure of the name. I often wonder if I’d be better served by saving the space in the garden and just buying what we need. I’m just really lazy about getting up and out of the house on Saturday mornings for Farmer’s Markets. I’d much rather potter about my own garden in PJs with my coffee! For us part of the issue is that I use up all the sunny space with my ornamental and native plants. I keep promising Judy that when we are retired we will get an allotment at the local park and grow lots of our own vegetables the way her mother used to. I love the idea of an allotment! But yes, they do take time! We have full sun in spades, but if I were in your shoes I’d rather give that space to ornamental plants too! PreviousGarden(ing) as a Stress Reliever.